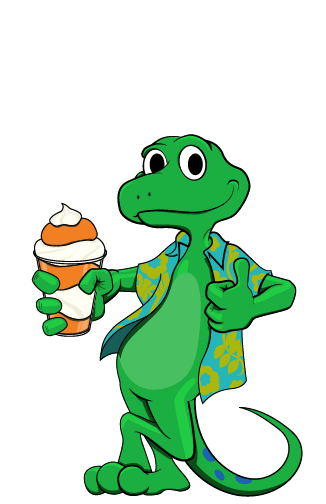 Gelati Joe's | Have an Ice Day! At Gelati Joe’s we create the best Italian Ice you have ever tasted. We use fresh fruit,natural ingredients, water and cane sugar to create an Italian Ice that has the flavor and creaminess of ice cream, but without the excess fat. We have over 30 flavors of Italian Ice, which include some refreshing favorites like Lemon, Cherry and Strawberry, some fun flavors like Blue Raspberry, Pina Colada and Watermelon, to new flavors like Peanut Butter, Cookies and Cream and Mint Chocolate Chip! Combine any of our Italian Ices with our decadent soft serve ice cream and you have our flagship dessert: the Gelati. The Gelati gives you a truly sinful treat but with half the fat of ice cream! The original Gelati has inspired us to make new, even healthier, creations to add to our line-up. Our next Gelati creation is the Snow-Yo. This is created by layering any Italian Ice with our healthy yogurt. All of our yogurts are high in probiotics and calcium. This creates a light dessert that also gives you the health benefits of yogurt. And finally, our lightest Gelati creation, at less than 150 calories, is the Gelati Lite. This creation is made by layering our fat free, sugar free Italian Ice with our fat free, sugar free Skinny Serve Ice Cream. What you end up with is a sin-free dessert with fewer calories than a low cal smoothie, but with flavor that can’t be beat. Also we wanted to offer our customers some of the usual treats found at most traditional ice cream shops. These include our three soft serve products (ice cream, yogurt and skinny serve) that can be served in a cup or cone with multiple toppings and flavor configurations. You can also get any of our soft serves dipped in Butterscotch, Cherry, or Chocolate. We also offer many nostalgic sodas in glass bottles for your enjoyment, including Cheerwine, Orange Crush, Mello Yellow, and Cane Sugar Coca Cola. Come enjoy one of our refreshing treats at any of our fun, upbeat locations and see what everyone’s talking about! Let us cater your event or come by and pick up your own party buckets for your next gathering. Please call for catering options, availability & party bucket pricing! Gelati Joe’s prides itself on being involved in and giving back to the Lakeland community. Please contact us if you would like to partner with Gelati Joe’s on your next fundraising campaign or event. A layered mixture of Italian Ice and soft serve ice cream, create it your way! Choose an Italian Ice and soft serve yogurt for a treat that is high in calcium, contains beneficial probiotics and is low in calories. Choose a sugar free Italian Ice and fat free sugar free soft serve for a truly guilt-free indulgence. Our ice is made fresh daily using natural ingredients. Each refreshing flavor is made in an ice cream churn to create a smooth and creamy consistency. We also feature seasonal flavors made from only the freshest seasonal fruits to supply you with the healthiest, freshest treats available! Ask your dessert artist what special we have today! All of our soft serve comes from local dairy farms to ensure quality and is slow churned to enhance the flavor and creaminess. Our full flavored and most delectable option. Available in Vanilla, Chocolate and Swirl. A truly guilt free, delicious treat! Our Dole Whip is Vegan, Cholesterol Free, Fat Free, Gluten Free and Lactose Free! You may recognize it as the same treat that is served at Disney World! All of our soft serve can be served in a cup, cake cone, gluten free cone, or waffle cone. Ask your dessert artist to dip it or top it for an unbelievably delicious experience! Our yogurt provides one of the healthiest & tastiest ice cream alternatives in the market! Order any of your favorite desserts with yogurt and get a treat that's half the calories without compromising the delicious taste that you're looking for! All of our yogurts contain live, active probiotics which promote immune system and digestive health! Phone 863.646.3500 - S Florida Ave.
Click here to activate it! Don't have one? Pick one up next time you're in, and earn FREE treats! to keep up to date on our upcoming promotions & events!